The North Atlantic Treaty Organization was created in 1949 by the United States, Canada, and several Western European nations to provide collective security against the Soviet Union. NATO was the first peacetime military alliance the United States entered into outside of the Western Hemisphere. After the destruction of the Second World War, the nations of Europe struggled to rebuild their economies and ensure their security. The former required a massive influx of aid to help the war-torn landscapes re-establish industries and produce food, and the latter required assurances against a resurgent Germany or incursions from the Soviet Union. The United States viewed an economically strong, rearmed, and integrated Europe as vital to the prevention of communist expansion across the continent. As a result, Secretary of State George Marshall proposed a program of large-scale economic aid to Europe. The resulting European Recovery Program, or Marshall Plan, not only facilitated European economic integration but promoted the idea of shared interests and cooperation between the United States and Europe. Soviet refusal either to participate in the Marshall Plan or to allow its satellite states in Eastern Europe to accept the economic assistance helped to reinforce the growing division between east and west in Europe. In 1947–1948, a series of events caused the nations of Western Europe to become concerned about their physical and political security and the United States to become more closely involved with European affairs. The ongoing civil war in Greece, along with tensions in Turkey, led President Harry S. Truman to assert that the United States would provide economic and military aid to both countries, as well as to any other nation struggling against an attempt at subjugation. A Soviet-sponsored coup in Czechoslovakia resulted in a communist government coming to power on the borders of Germany. Attention also focused on elections in Italy as the communist party had made significant gains among Italian voters. Furthermore, events in Germany also caused concern. The occupation and governance of Germany after the war had long been disputed, and in mid-1948, Soviet premier Joseph Stalin chose to test Western resolve by implementing a blockade against West Berlin, which was then under joint U.S., British, and French control but surrounded by Soviet-controlled East Germany. This Berlin Crisis brought the United States and the Soviet Union to the brink of conflict, although a massive airlift to resupply the city for the duration of the blockade helped to prevent an outright confrontation. These events caused U.S. officials to grow increasingly wary of the possibility that the countries of Western Europe might deal with their security concerns by negotiating with the Soviets. To counter this possible turn of events, the Truman Administration considered the possibility of forming a European-American alliance that would commit the United States to bolstering the security of Western Europe. The Western European countries were willing to consider a collective security solution. In response to increasing tensions and security concerns, representatives of several countries of Western Europe gathered together to create a military alliance. 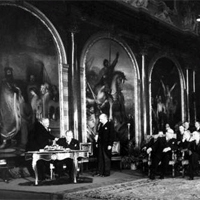 Great Britain, France, Belgium, the Netherlands and Luxembourg signed the Brussels Treaty in March, 1948. Their treaty provided collective defense; if any one of these nations was attacked, the others were bound to help defend it. At the same time, the Truman Administration instituted a peacetime draft, increased military spending, and called upon the historically isolationist Republican Congress to consider a military alliance with Europe. In May of 1948, Republican Senator Arthur H. Vandenburg proposed a resolution suggesting that the President seek a security treaty with Western Europe that would adhere to the United Nations charter but exist outside of the Security Council where the Soviet Union held veto power. 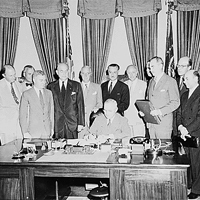 The Vandenburg Resolution passed, and negotiations began for the North Atlantic Treaty. In spite of general agreement on the concept behind the treaty, it took several months to work out the exact terms. The U.S. Congress had embraced the pursuit of the international alliance, but it remained concerned about the wording of the treaty. The nations of Western Europe wanted assurances that the United States would intervene automatically in the event of an attack, but under the U.S. Constitution the power to declare war rested with Congress. Negotiations worked toward finding language that would reassure the European states but not obligate the United States to act in a way that violated its own laws. Additionally, European contributions to collective security would require large-scale military assistance from the United States to help rebuild Western Europe’s defense capabilities. While the European nations argued for individual grants and aid, the United States wanted to make aid conditional on regional coordination. A third issue was the question of scope. The Brussels Treaty signatories preferred that membership in the alliance be restricted to the members of that treaty plus the United States. The U.S. negotiators felt there was more to be gained from enlarging the new treaty to include the countries of the North Atlantic, including Canada, Iceland, Denmark, Norway, Ireland, and Portugal. Together, these countries held territory that formed a bridge between the opposite shores of the Atlantic Ocean, which would facilitate military action if it became necessary. The result of these extensive negotiations was the signing of the North Atlantic Treaty in 1949. In this agreement, the United States, Canada, Belgium, Denmark, France, Iceland, Italy, Luxemburg, the Netherlands, Norway, Portugal, and the United Kingdom agreed to consider attack against one an attack against all, along with consultations about threats and defense matters. This collective defense arrangement only formally applied to attacks against the signatories that occurred in Europe or North America; it did not include conflicts in colonial territories. After the treaty was signed, a number of the signatories made requests to the United States for military aid. 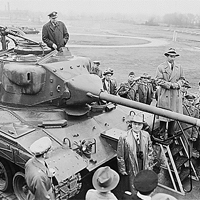 Later in 1949, President Truman proposed a military assistance program, and the Mutual Defense Assistance Program passed the U.S. Congress in October, appropriating some $1.4 billion dollars for the purpose of building Western European defenses. Soon after the creation of the North Atlantic Treaty Organization, the outbreak of the Korean War led the members to move quickly to integrate and coordinate their defense forces through a centralized headquarters. The North Korean attack on South Korea was widely viewed at the time to be an example of communist aggression directed by Moscow, so the United States bolstered its troop commitments to Europe to provide assurances against Soviet aggression on the European continent. In 1952, the members agreed to admit Greece and Turkey to NATO and added the Federal Republic of Germany in 1955. West German entry led the Soviet Union to retaliate with its own regional alliance, which took the form of the Warsaw Treaty Organization and included the Soviet satellite states of Eastern Europe as members. The collective defense arrangements in NATO served to place the whole of Western Europe under the American “nuclear umbrella.” In the 1950s, one of the first military doctrines of NATO emerged in the form of “massive retaliation,” or the idea that if any member was attacked, the United States would respond with a large-scale nuclear attack. The threat of this form of response was meant to serve as a deterrent against Soviet aggression on the continent. Although formed in response to the exigencies of the developing Cold War, NATO has lasted beyond the end of that conflict, with membership even expanding to include some former Soviet states. It remains the largest peacetime military alliance in the world.